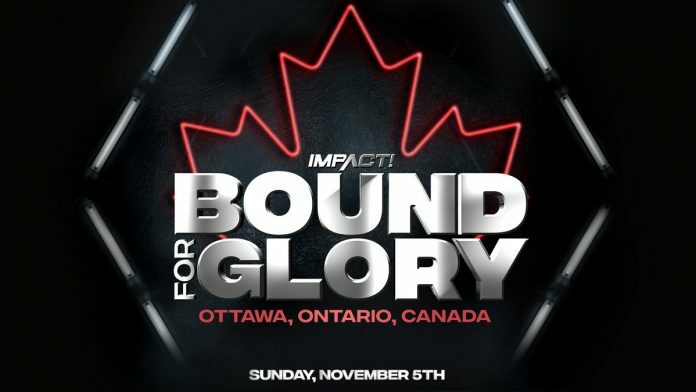 Anthem announced Monday the Bound for Glory PPV and Impact TV tapings would be taking place the weekend of November 5-10 in Ottawa, Ontario, Canada. The company teased yesterday that the event would be held in Canada in what will be the first Bound for Glory outside of Orlando since 2015 (held in North Carolina). As also noted in the same report, it’s been interesting to note Anthem once again refer to the promotion simply as Impact Wrestling and not as GFW. No mention is made of Global Force Wrestling in the actual press release issued today. What this means for the current championships and the branding going forward remains to be seen, but it remains an interesting topic of discussion since the indefinite leave of Jeff Jarrett and his ownership over the rights to the Global Force Wrestling name. NASHVILLE | TORONTO – IMPACT Wrestling, a subsidiary of Anthem Sports & Entertainment Corp., announced today that Bound for Glory, its premier annual pay-per-view event, will be broadcast from the historic Aberdeen Pavilion in Ottawa, Ontario, Canada on Sunday, November 5, 2017. The Aberdeen Pavilion will also play host to five days of IMPACT television tapings from Nov. 6 to Nov. 10. Ticket on-sale information for Bound for Glory and IMPACT will be revealed in the coming weeks. Bound for Glory will feature World Champion Eli Drake, former champion Alberto el Patron and Johnny Impact, the holder of the Mega, Latin American and World Cruiserweight championship belts in Lucha Libre AAA, who will be making his inaugural Bound for Glory appearance. Bobby Lashley has unfinished business; will he return and will his cohorts from American Top Team, led by owner Dan Lambert, continue to meddle with his career? The Knockouts will collide as Hall of Famer Gail Kim works through her final year in professional wrestling, and the stars of the X-Division will bring their high-flying brand of athletics to the ring. International talent for the event will include El Hijo del Fantasma, Pagano and El Texano Jr. from Lucha Libre AAA. Located in Lansdowne Park, the historic fairgrounds of Canada’s national capital, the 33,000-square foot Aberdeen Pavilion is an Ottawa landmark, which has been home to many significant events throughout the city’s history, including Stanley Cup challenge matches in 1904. Built in 1898 and inspired by London’s Crystal Palace, the venue was designated a national historic site of Canada because it is the only large-scale exhibition building in Canada surviving from the 19th century. Showcasing some of the biggest stars in professional wrestling, IMPACT airs on Thursdays at 8:00 p.m. ET/PT on Pop in the U.S., as well as Fight Network and GameTV across Canada. Unprecedented! A company to go from NWATNA, to TNA, to Impact Wrestling, to GFW, to just Impact. Still never understood why they never tried to merge with a smaller promotion like PWG or ROH. Instead, they would rather keep failing alone. Makes no sense. Cornette noted that he came to GFW after being called in August by Jeff Jarrett, & the agreement was just to work one set of television tapings to facilitate a few storylines, which were the stripping of the championship from Alberto El Patron & the gauntlet match, the on-screen firing of Bruce Prichard so he could return as a heel manager, & to try & make Anthem Sports & Entertainment babyfaces to the wrestling fans. After the tapings, he & Jarrett agreed that he would come back for Bound for Glory & for a few days at the next tapings in November. Cornette didn’t know his status with Jarrett now out of the company & the company’s creative, headed by Scott D’Amore & Sonjay Dutt, said to be more focused on in-ring action & less on authority figure angles. Cornette hadn’t heard from anyone in the company other than Bob Ryder, who told him not to believe what he read on the Internet, & spoke to Dutch Mantell, where he explained with the tapings being done in Canada that he wouldn’t be able to appear. Cornette agreed to come to Nashville & do whatever would be needed on camera to do a storyline exit. Right now there is nothing on the table for it. Cornette is expected to go into more detail on this on his podcast on Thursday. Why Ottawa, I can’t see them drawing for BFG their, let alone whole week of TV tapings. Toronto would have made a lot more sense or even Montreal. Sadly I think this will be a real fail. They screwed up big time, as always. They should have just kept it as “TNA”. It was already an established brand that millions of people were already familiar with. GFW was pretty much a non-entity when Anthem came into the picture. Just plain stupid. They felt the TNA name had stench attached to it that they wanted to move away from but I agree they should have either stayed with what was known or at least with Impact on its own rather than add GFW if they wanted to drop TNA – they could have just called it IMPACT Championship Wrestling or something and focused on the Impact part of the name for established branding purposes. Agreed but there must have been a cost related reason because Toronto was the most logical choice and Anthem is even based there so they must have done this to save money somewhere. Perhaps they feel they’ll get people to drive from Montreal and TO for each taping but this truly could become an epic Anthem fail story! I really hate that they tape so many shows in advance. Takes much of the freshness away from the product.